Book Boney M with Liz Mitchell and not incur any unnecessary complications, extra charges and fees. Boney M News The main goal of every event organiser is to book Boney M with Liz Mitchell and not incur any unnecessary complications, extra charges and fees. The main goal of every event organiser is to book Boney M with Liz Mitchell and not incur any unnecessary complications, extra charges and fees. Nobody wants to get involved into any legal issues, as it can affect the reputation of the event organisers. The official website of Liz Mitchell is pleased to inform you that Boney M feat Liz Mitchell has the official permission to perform Boney M songs. Frank Farrian, the founder and former producer of Boney M used to own all the rights for the brand of Boney M, its melodies and lyrics. 28 years ago the German impresario and producer has shared the rights to perform Boney M songs to the lead singer of the band, Liz Mitchell. Once Frank Farian lost interest to the disco project in 1985 and the band started falling apart, followed by several court cases from 1987 till 1989, the founder has allowed the band members to use the band’s logo on their posters and in press. Disco music singer Liz Mitchell is most certainly the most well known and loved soloist of Boney M, always look out for Liz Mitchell feat Boney M on the posters. Although Frank Farian will always be the founder and the owner of the brand of Boney M, he once said that every single member of Boney M could be replaced, except for Liz Mitchell, as she has got the most incredible voice and unique talent. 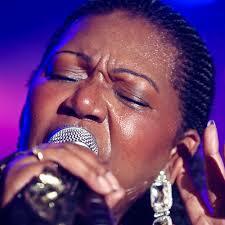 Liz Mitchell is the voice of Boney M.